Today, many people are willing to compromise. They accept evolution — and yet claim to believe in God. Are the two mutually compatible? Can you really believe in GOD and evolution? Read, in this article how such ideas are full of holes — moth holes to be exact! In the November, 1966 issue of The PLAIN TRUTH, we printed a letter from atheistic evolutionist — one who claims to believe in evolution AND God! Since that time, a few others have written, insisting that one can believe in both evolution and God. "I consider it somewhat unfortunate that you equate belief in evolution with disbelief in God. Most educated people believe in BOTH," writes a man from an Ohio college. "This is my personal belief — a divine creation FOLLOWED by evolution. Could God not have created, say, a blob of some sort, millions or billions of years ago, which GRADUALLY grew into life as we know it? Why could not God, after starting with the 'blob', work through evolution in His creation?" These letters illustrate a common theological idea in circulation today. Of course, it's not a matter of "what most educated people believe." It doesn't matter whether ONE THINKS God used evolution. The question is: "What does God say?" Personal opinions count for nothing. We go to the source of all authority — in this case — GOD HIMSELF! This subject is so vitally important, that we are reprinting here some of the questions posed by the theistic evolutionist whose letter appeared in the November, 1966, PLAIN TRUTH — together with the proven answers. 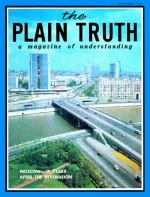 "I have just read 'The Questions Evolution Can't Answer' in the October, 1966, PLAIN TRUTH. "You seem to assume that we are all either believers or evolutionists, as if the two were mutually exclusive. I would appreciate answers to the following by you or any of your staff biologists at Ambassador." Before continuing the letter, and answering the questions set forth in it — we should point out that none of the questions posed in our article were answered in his letter. Our article challenged evolution — as have subsequent articles — to give plausible answers. The writer of the letter did not attempt to answer the questions posed in The PLAIN TRUTH, but asked a few of his own. His questions were directly on the subject of whether evolution can be a fact and God can exist — both at the same time! His questions are answerable. Here they are. Question: Would you allow God to create animal species by an evolutionary process if He saw fit to do so? Answer: We neither allow nor disallow God to do anything! God is ALL powerful, RULING SUPREME — it is not a question of what WE ALLOW — but a question of WHAT DID GOD DO? The questioner seems to believe there IS a God, but that God "used" evolution as the tool by which He created! If God had done this, and if He PLAINLY TOLD us He had, by revealing it to us in His sacred WORD to man, CERTAINLY we would believe it. But God says otherwise. He plainly reveals in a detailed account the CREATION of all the organic life on this planet. God REVEALS how life was created suddenly! Genesis, the first two chapters, gives a clear account! Question: If the universe appears to run on orderly laws, could the Creator not order things into being by an evolutionary process, knowing that His laws of thermodynamics, gravity, cause and effect would result in the order and beauty we see, without any need to pull out of a hat or produce woodpeckers by saying magic words? Is the archer fish [and therefore the whole creation] any less inspiring if God allowed centuries of His evolution to produce it? Answer: What do you mean "IF" the universe appears to run on orderly laws? It DOES run according to orderly law! And the incontrovertibility of those same laws PROVES the Creator did not set into motion great FORCES, POWERS, and ENERGIES, and then allow those laws to gradually BREAK themselves, deny themselves, alter themselves, so as to bring about a supposed evolutionary process. The archer fish — and all other creatures — would be not only LESS INSPIRING — but would be NONEXISTENT if it depended upon a fanciful "evolutionary" process! And speaking about "magic words," how's THIS quotation from an evolutionist, published in the Amarillo Daily News, November 19, 1965? "Chemicals, in general, follow certain laws in combining. These laws are as binding on the chemicals as the physical laws are on falling bodies. "Over millions and perhaps billions of years [would you believe trillions??]. countless chemical reactions took place, building more and more complex compounds. That's quite a "trick," all right! Who is it who feels "magic words" and "pulling rabbits out of "hats" necessary for the defense of their views? Evolutionists believe in just such "magic," while a Creationist, or a firm believer in the great God who CREATED all things, JUST AS STATED IN THE BIBLE, believes in the Divine power of His GOD, not in chemical compounds "learning" sneaky little tricks! Question: Would God arrange the evidence of orderly processes and ecological adaptations and even manipulate rates of radioactive decay to give us a false idea of geological time, and then give us minds that inquire and find only consistent misinformation leading to a false doctrine of evolution? Answer: Are you admitting evolution is a false doctrine? First, the "orderly processes" of which you speak ARE orderly. But when geneticists try to attach the LABEL of "orderly processes" to impossible CHAOTIC LEAPS from ONE SPECIES to another — there is nothing "orderly" about their theories. Large mutations DO OCCUR. These mutants, however, are fundamentally degenerative deformities, not so well equipped to survive as a few of the minor mutations are. Geneticists realize this. That is why they are forced to accept an unprovable theory of minute, micro-mutations over VAST periods of time as producing evolution. They know any sudden great change in a creature would kill it! But this synthetic theory of slow mutations contradicts the fossil record which plainly shows the VERY SUDDEN appearance of insects, plants, animals. Then follows supposed millions upon millions of years (as evolutionists count time) — of NO CHANGE in the order, genera or whatever. The fossil record is clear on this. The one contradicts the other. It's a blind alley for evolution — from which there is no logical escape. Mutations produce only varieties WITHIN a Genesis KIND, not whole new forms as evolution claims. Second, ecological adaptations are nothing more than normal, LAWFUL, and completely orderly changes IN INDIVIDUAL CREATURES or within defined SPECIES that fit them for their environmental conditions. The changing of an animal's coat of fur or color with the seasons proves NOTHING for evolution — but DOES prove the great and careful DESIGN thought out by the Creator. No, there is no conflict between TRUE science, and the Bible. However, it is very common in today's scientific world to hear theologians espousing the self-conflicting God and evolution doctrine. But what is the PURPOSE behind modern man's and liberal theology's desire to see evolution as the "tool" God used in His creation? Is it because they desire to keep God MUTE? Many want a "first cause" type of God, a Metaphysical Dean; or a blind "force," way off in the universe, who is not a definite RULING PERSONALITY! Men want to keep God DISTANT, UNABLE to interfere in the course of human events, unable to INTERVENE in their own private lives! Modern man doesn't want a God who decrees laws of morality. So Theistic Evolution is man's explanation of a God man might accept. God CREATED. Just as He said, It's the proven, absolute truth! We can't have the doctrine of Creation as expounded in your Bible and the theory of evolution. Each eliminates the other. When Charles Darwin, Huxley and others began to promulgate evolution, they KNEW it was either evolution or creation! There was no middle ground. "The one fundamental Christian Doctrine to which Darwin seemed to pose the most direct threat was certainly the doctrine of creation. If evolution was right, CREATION WAS WRONG" (Issues In Evolution, Jaroslav Pelikan, page 30). Anyone who believes the Bible literally KNOWS this is a fact. Either animals, plants, in sects — and man — were created SUDDENLY or you might as well throw out the Bible. But this is the Age of Compromise. Men want to water down the truth of God. They want to be accepted by society. Since today science is God — any scientific pronouncements from the modern pulpit (even if these pronouncements VIOLATE scientific principles) are gobbled up and accepted. "There were many others [theologians] whose VIEW of scripture allowed the acceptance of evolution. "They interpreted the Biblical account as a symbolic and poetic rendition... which they found not incompatible with the picture of evolution as GOD'S WAY of creating" (Issues in Science and Religion, Ian G. Barbour, page 97). Ah, did you catch it? Phrases such as "whose view of scripture," "they interpreted," "they found not incompatible" illustrate a point. These were MEN'S ideas; men's interpretations; men's findings. But what does your BIBLE say? Men said the accounts of creation were myths. Oh, but then the rest of the Bible might be myth too. No, either the Bible is INFALLIBLE and gives us the basis for understanding the universe or it is of no value. We've been proving in this series of articles that the Bible is scientific! We have proved, we are proving, and we will prove that creation, design, law in the universe PROVES God exists. Of course there are fossils. The fossil record proves creation. You'll read some of that in this article. We don't say the earth was created in 4004 B.C., as some do, because the Bible doesn't make that claim. As a matter of fact, upcoming in a few issues will be articles on the origin of the universe, solar system and the earth. The universe may be billions of years old! Strata may be more than 6000 years old — though the fossils contained in those strata are not as old as evolutionists would have you think. And, we'll prove this in future articles. But the Bible PROVES that God created the universe, the earth — and ALL life upon it! And since evolutionists base their "proof" on the record of paleontology — and ESPECIALLY USE the complexity of life around us to try to prove evolution, we go to these records to show they PROVE CREATION! In this article, we want to continue the subject of moths. This time we'll delve into the mysterious marvel of metamorphosis — and the record of paleontology of the moths. One of the most common occurrences in the insect world is metamorphosis — which merely means change of form. Yet, it provides another spectacular proof of God's existence. Scientists who do not believe GOD CREATED this process simply have no plausible explanation for its existence. "The magical stranger: in this sequence is the caterpillar itself — A WAYWARD FORM that has somehow interjected itself between egg and winged adult... there is no evidence of how such a remarkable plan of life ever came about" (The Insects, LIFE NATURE LIBRARY with Peter Farb, page 56). Photos In top row, left to right, show: egg of hornworm larva next to pinhead; newly hatched larva measuring a half inch in length; full grown larva about three Inches long; larva changing into pupa stage; chrysalis forming; fully formed chrysalis. it evolved! Is this rational thinking? Scientists refer to it as the "marvel of metamorphosis" and call it a "mystifying series of transformations." Nevertheless, some 87 percent of all insects continue to go through this remarkable metamorphosis. To complicate matters, there are two types of metamorphosis in the insect world. One is complete, the other incomplete. But why doesn't the moth, butterfly or other insect simply hatch from an egg — like a chicken? Why such a devious route through a larva and pupa stage — when the adult is acknowledged to be the normal form? Evolutionists are hard-pressed to answer. "The... question, how did this process of transformation arise in the course of evolution? — is difficult to answer. "The most likely SUPPOSITION is that there has been an independent evolution of the different 'stages' of insects... as soon as two partially independent sets of genes become separated in this way it is easy to see how the larva and the adult could proceed to evolve and change INDEPENDENTLY of one another. "And when the larva and the adult come to live in different surroundings, and to feed on different foods, they will become more and more unlike one another — until a spectacular 'metamorphosis' is needed to convert the one into the other. "PERHAPS the origin of the pupa is to be sought along the same lines, the independent evolution of an intermediate stage..." (Life of Insects, V. B. Wigglesworth, pages 95-97). We are asked to believe that possibly three widely different stages evolved TOGETHER. And that thousands of varieties of insects came up with the SAME plan — yet each doing it a little differently! All this without planning. How did genes become "separated" — some controlling various parts of the larva, some the adult, some the transformation in the pupa? What selective value would intermediate stages have? If this value was so great, why doesn't ALL LIFE go through such a metamorphosis? What do you mean larva and adult come to live in DIFFERENT surroundings? Generally, there is one food for a particular species of caterpillar. For example, a tomato horn worm larva will eat leaves of the tomato plant (and a few others). But could it survive if the food supply gave out? Absolutely not. So if there wasn't enough food to eat, the larva couldn't live to turn into a moth. But if there were enough tomato plants around, why should the moth then turn to eat some other food? And, if the food supply gave out between the larva and adult stage — how could THE ADULT MOTHS survive? They couldn't — assuming, of course, that they ate the same food as the larva — which they DON'T! Yet, somehow, the adult moth — though it doesn't eat any solid food lays eggs on the food substance which the larva stage will NEED in order to survive. Now, how did they figure that out? How do they know on which tree, bush or weed to lay their eggs? Also, many moths lay their eggs in a place that will give the larva protection. Yet, each species of moth does the job a little differently. How did different types of moth eggs arise? How did moths know where to lay eggs for greatest protection and food supply? Of course, they — the moths — DON'T KNOW. But GOD knows. Because He created them and built the instinct INTO them. Does Evolution Really Explain Anything? In the Ambassador College Photographic Research Laboratory we have photographed various stages of moths and butterflies. We have obtained photographs of the complete metamorphosis marvel. How anyone could think all this evolved is simply BEYOND comprehension. Too many people simply don't observe God's creation! For example, as the larva prepares to enter the pupa stage, it first finds a convenient leaf, stem or whatever. Some species then proceed to spin a silk enclosure. They have glands that secrete a liquid which hardens into thread. Here is a larva that possesses a chemical factory, has marvelous architectural abilities, and is a master builder. The larva has never been taught this. He just does it! And of course this is only a SMALL part of the magnificent story. In the pupa or chrysalis stage a complete transformation takes place. NOTHING remains unchanged. Slowly, bit by bit, a beautiful moth or butterfly appears. To recount all the marvels step by step would take an encyclopedia! The process is very intriguing — and perfectly designed. A moth larva eats only solid food for tissue-building proteins! But the adult moth — if it eats at all — takes in only nectar — rich in sugar and energy-giving properties. Each has the food it needs. The young larva is fitted for an entirely different mode of life than the adult. The larva feeds, grows, converts food into insect tissue. The adult flies, pollinates, reproduces. Could any master designer have improved on this plan? What would it take to turn a larva into a full adult moth? One well known entomologist gave this analogy. During the pupa stage the tissues of the crawling larva are torn down and rebuilt into organs for aerial life. It's like tearing down an automobile. Then taking the automobile components and reassembling them part by part into a PERFECT flying jet. And this is only a crude illustration since living things are far more complex. evolved? Pardon us if we chuckle for a moment! How Did Moths Get Here? It is important for PLAIN TRUTH readers to realize how most entomologists, biologists and others reason about the moth's supposed evolutionary history. The ideas presented are TYPICAL of the presumed evolutionary history of insects. "Lepidoptera, then, are probably descended from aquatic ancestors, but their relationship to the primitive aquatics is NOT UNDERSTOOD. "It is interesting to speculate on the functional significance of the scaly wings of the Lepidoptera. The theory most often cited is that the scales serve to strengthen the wings, which have comparatively few cross veins. "THIS THEORY IS PROBABLY NOT CORRECT. There are some butterflies with naked wings, without any changes in venation to compensate for any weakness that might result. "Another theory, which may be correct, is more involved, but is based on the IDEA that..." (The Insects, Url Lanham, page 215). "The odd thing about the evolutionary history of the insects is that they seem to be ESSENTIALLY THE SAME today [as in the supposedly earliest fossil insect records] in structure, diversity and abundance." Did you notice the "speculations," "theories cited," "ideas," "odd things"? — proof evolutionists don't know! Let's separate facts from fiction. Fossils — supposedly 40 to 60 million years old — look just like moths today. The author says its odd? Because he assumes they should have evolved over this period of time. But there's NO PROBLEM once you realize moths were created. The fossil record plainly shows that moths, butterflies and other insects came into being SUDDENLY. Then they remained unchanged. Also, paleontologists admit insects and flowering plants seem to SUDDENLY appear together in the fossil record. Again, another proof of the interdependency of life and the Genesis account of creation. But let's understand what evolutionists are doing. They analyze the structure of moths, butterflies, caddis flies. This much is fact! But then they compare those structures and set up a HYPOTHETICAL FAMILY RELATIONSHIP. This is pure fancy! It is arguing by an analogy based on the theory of evolution. Did you ever wonder how evolutionists "know" one form of life has evolved from another? Very simply. They set up "hypothetical" family trees and ancestors. The word itself should tell you how valid these "set-ups" are. Here's how it's generally done. "The HYPOTHETICAL ancestor of the insects would be a worm-like creature with its body made up of ring-like segments, each supported by a pair of appendages or limbs... the entire HYPOTHETICAL creature would resemble a primitive sort of centipede, probably not measuring more than a few millimeters in length." After continuing his discussion of the insects, the author admits: "It is generally accepted that one form has evolved in course of time from another; but the mechanism by which evolution has been brought about is still a subject FOR CONTROVERSY. The theory that is best supported by evidence, and is in fact most widely accepted by biologists, is that of Charles Darwin: the theory of natural selection with the survival of the fittest. "These notions are NOT 'PROVED' in the popular sense of our knowing as a fact that the changes during evolution did happen in that way. Like all scientific theories the 'theory of natural selection' is merely a provisional description of what WE BELIEVE has happened and is happening. "There is at present no other theory which fits the facts so well; it will, therefore, BE ACCEPTED THROUGHOUT THIS BOOK as the basis for thinking about the life of insects" (The Life of Insects, V. B. Wigglesworth, pages 1-3). Here, again — notice words such as "hypothetical," origin quite unknown," "generally accepted," "controversy," "theory," "not proved," "provisional," "we believe." Rather a shaky foundation to be accepted THROUGHOUT a book! The quote should be self-explanatory. It is first taken for granted that insects evolved. Therefore, bees, ants, beetles, fleas, two-winged flies, caddis flies, scorpions, lacewings supposedly evolved from the same ancestor as the MOTHS. But fossil moths look like MOTHS! Fossil ants look like modern ANTS! There are no intermediate half-moth, half-caddis-fly fossils. Yet, IN SPITE OF THE FACTS, evolutionists claim they all evolved from a common ancestor. The author already told us. Scientists, as a whole, take for granted that evolution is a fact. It should be quite obvious to anyone that evolution is a theory which explains NOTHING. Evolutionists cry that creation by God is too "simple" to accept. Supposedly, evolution explains how life came to be. But we've shown article by article that evolution DOES NOT EXPLAIN how life came to be — and admits it doesn't know. "But ask the BEASTS and they will teach you. The BIRDS of the air and they will tell you. Or the PLANTS of the earth and they will teach you. And the FISH of the sea will declare to you. "Who among all these does not know that the HAND OF THE LORD has done this" (Job 12:7-9, Revised Standard Version). Life around us teaches us that God is Creator. The evolutionists don't know it — but YOU can! If you're willing to humble yourself and acknowledge His authority.